Climate change is bringing longer and more destructive fire seasons. Climate change has not only sent global temperatures spiraling out of control, it has breathed fire into Earth’s wild lands. Fire seasons are an average 78 days longer than they were in 1970, and the number of acres scorched each year has doubled since 1980, according to the U.S. Department of Agriculture. If the start of the 2016 fire season is any indication, this alarming trend won’t be extinguished anytime soon. NASA is providing a unique view of the destruction by using satellites to help track and monitor fires ― valuable information for fire managers on the ground ― as well as look at how these blazes are affecting air quality and releasing greenhouse gases. In May, a wildfire driven by unusually hot, dry weather burned through the town of Fort McMurray in Alberta, Canada, scorching nearly 1.5 million acres and displacing tens of thousands of people. In California, two major wildfires ― the Soberanes fire along the Central Coast and the Sand fire around the Santa Clarita Valley near Los Angeles ― continue to rage. As of Friday, they had burned a collective 70,000 acres. While these large fires have garnered widespread media attention, they only begin to tell the story of what’s happening in the U.S. and around the world. 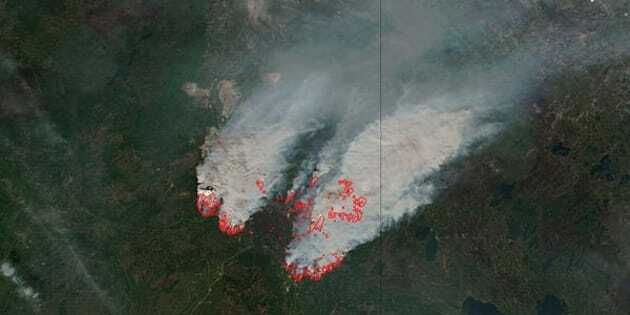 Below, a look at some of NASA’s incredible and gut-wrenching satellite imagery of this year’s fires, from California and China, to Canada to Russia. The Aqua satellite captured this image of the Soberanes fire in northern California on July 27, 2016. In this July 2, 2016 photo, fires are seen raging in northern Saskatchewan and the Northwestern Territories of Canada.